Naturasil Immune Booster Dog Vitamins are a chewable (treat type) vegetarian formula great way to help boost your pet's immune system to help fight various conditions including lathargy, mange, ringworm from the inside out. NOTE: For sick, convalescing, pregnant or nursing dogs under 10 lbs: 1 tablet (daily); Over 10 lbs. : 2 tablets (daily). Inactive Ingredients: Dicalcium Phosphate, Maltodextrins, Dried Whey, Microcrystalline Cellulose, Non-Fat Dry Milk, Natural Flavoring, Montmorillonite Clay, Lecithin, Brewer’s Dried Yeast, Stearic Acid, Vegetable Oil, Hydrogenated Cottonseed Oil, Magnesium Stearate, Ferrous Sulfate, Niacin Supplement, Beta Carotene, Vitamin A Palmitate, Zinc Sulfate, Vitamin E Supplement, dl-Methionine, Riboflavin, Silica Aerogel, Thiamine Mononitrate, Vitamin D3 Supplement, Manganese Sulfate, Pyridoxine Hydrochloride, Copper Carbonate, Potassium Iodide, Cobalt Carbonate and Vitamin B12 Supplement. Hi- My two dogs absolutely look forward to these "treats" every morning. It is great to give them vitamins they love to eat! These vitamins along with your Naturasil for Mange product helped clear up my dog Bonnie to the point she is cured of mange. Many thanks! This really boosted my dogs immune system so he can fight the demodex mites. Thank you so much! Vets wanted to put my little boy down!!! After my little boy battled being sick for months, he came down with demodex. The vets wanted to put him down. I went home and cried and prayed for God to help me find something to help him. After all, he created him and who was I to say when he was to die. God guided to your website. I ordered your product and used it as stated. I also used Ivomectin. You would not believe my little boy now. He is learning how to play. He is truly miracle. We have a puppy Husky and he had broke out in mange about 5 months old.He is now 8 months old.We had taken him to the vet about 6-8 times in two months and tried SOOO MANY different things.Then they started him on the Dip treatments.Nothing else did anything and he just kept getting worse.I love our dogs as if they were my kids so I felt so bad for him and was ready to try anything because he was so miserable! We did the dip and had to drop him off and they knocked him out for it and when we got him home he was so sick and wasn't right afterwards for about two days.It was so sad. Then I read about the dip treatment and it says that yes it can cure it but in the process it can also kill your dog.Scared me. At that point I told my husband I am done with all these drugs and dips.We HAVE to find something else.He agreed. So I started searching everywhere and reading everything for something safer and that would work because we were already out so much money. I came accross your page!I can't thank you enough.We bought your combo of shampoo and the mange treatment and vitamins.We have been useing it for about a month and it is working!He was so bad around his face and on one leg.So we knew nothing was going to work over night.But we did the 1st two treatments 3 days apart and then started every saturday giving him his baths.Now it has been a month.All scabes are gone.He is starting to look back to himself.He isnt itching anymore.It is great!We have about enough for two more baths.We are going to order more very soon so we don't have to miss a bath but we have desided it is time to drop down to every other week for a month and then monthly for awhile.WE CAN"T THANK YOU ENOUGH! Cesear can't either.It smells pretty bad but after seeing how it works....it is so worth it!!!!!!! SO WORTH IT!Just know that nothing works over night but also know that in a month......Your dog will be back to himself or darn close.Stay with it and you will see right away improvment starting and then with every bath they look better and better!!!!!!!! I LOVE YOU GUYS!!!!!! !I am so thankful!I didn't know how much more I could take.He was so sad and sore and bleeding and itching ALL THE TIME! it was so sad.Now he is a puppy again! Tearing up everything (Sighhh) but back to a normal puppy and I couldn't ask for more then that. I want everyone to know that THIS WORKS!!!!!!! and if you give it a month..... you will see it for yourself.After the first 2 baths you will start to see.Buy Two I say to start because you will need two but it will be gone after one but then I think you should maintain monthly baths for awhile.I am keeping him on Vitamins also until he is two years old at least because this combo worked perfectly!!!!! Again we need more soon and I couldn't be happier! I will continue to have this site under my favorites and I will rave about this to everyone as I already am and I will give info to anyone that runs into the same thing that we have been dealing with!This is the best stuff ever!And so safe!Open a couple windows and lite a candle and then just do it!!!!!!!!! THANK YOU SO MUCH!!!!!!!!!! Quickly Boosted My Cat's Health! I wasn't sure if other animals could use these vitamins so I called and talked to someone at Naturasil and they told me they could be used for my cat or any other animal. When I received them in the mail, I was surprised at how big the vitamins were and wondered how I would get my cat to eat them, but she literally tore into them like they were treats! She even bit my finger once because she was so eager to eat them lol! I'm sure that these vitamins played a huge part (along with your sulfur treatment) in helping her to recover so quickly from the mange! Again, I can't thank you enough!! I also took the advice you gave about feeding them extra nutritious food and she is putting her weight back on and is amazingly healthy-looking! Thank you for your thorough advice, and again thanx to EVERYONE who took the time to give advice to strangers! I read your reviews, often in tears, b/c it gave me hope for my cat who was in very poor health due to the mange. At times I wondered if I should just put her out of her misery because it was too awful to see her like that, but because of all the encouraging and helpful advice, I was hopeful and stuck to the treatments and now she is in better health than ever! I still can't believe it!!!! I got these after reading the reviews and the vitamins really work. My dog was starting to show signs of old age and didn't even want to engage in any play activity. He is back to his old self jumping, playing and carrying on. He loves the Naturasil vitamins. Every morning and evening he looks forward to his vitamin treats. My dog loves these vitamins! My little adopted Chihuahua mix loves these vitamins. He finishes his breakfast & sits patiently waiting for his daily vitamin. It's a crisis when I haven't ordered refills when we are running low! It took over a year to finally rid him of ringworm, and we want to keep it gone for good! 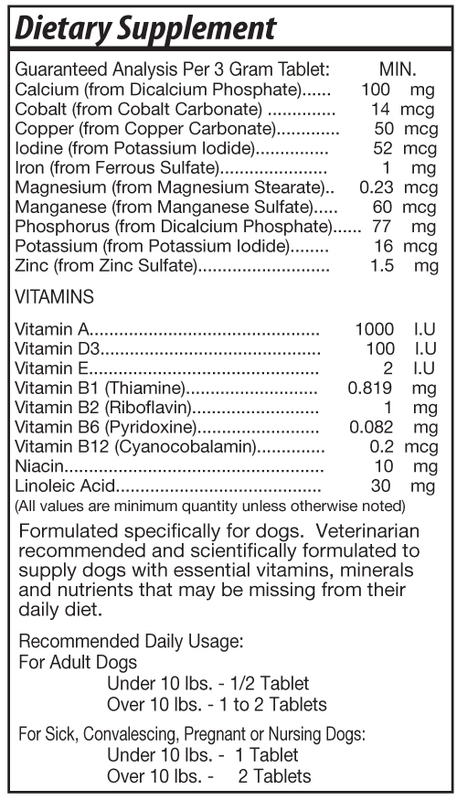 I've ordered this vitamin several times and they work very well with my two dogs. I had a minor issue with my last shipment and it was resolved quickly and I received a replacement as well. Well worth the price and they treat their customers well. Gave this to my 13 year old Lab and she seems to have a little more "pep in her step."